Today's the day the Leafy Accents Stamp, Die and Mold becomes available to everyone! Quick and easy to use, these leafy accents stamp, die, and shaping mold are wonderful tools to create dimensional leaves when time is running short, tired hands need a break or a design calls for a significant number of leaves! Special Savings: The Leafy Accents Stamp, Die and Mold Bundle has a 10% discount, only available until June 30th or while supplies last! Get yours today to ensure that you don't miss out on this special savings! The design team members are showcasing many different ways to use this new collection, along with a video to learn the EZ steps to create quick dimensional leaves. Quick and easy to use, these leafy accents stamp, die, and shaping mold are wonderful tools to create dimensional leaves when time is running short, tired hands need a break or a design calls for a significant number of leaves! Click play for a creative demo. Instructions: Click here to view a larger image of this project. Glue the two tags together and then cover with a piece of the cardstock. Go around the edges of the die with Grape Jelly Ink Memento Ink to accent the colors of the paper collection. Using Tuxedo Black ink, stamp the various leaves onto white cardstock. Using a dauber, color the leaves with New Sprout and Bamboo Leaves Memento ink and then cut out using the coordinating die. Place the leaves into the mold, spritz with water and run through the Vagabond to give them the beautiful 3D look! Allow the leaves to dry. Working with the yellow flowers, stamp onto Watercolor paper using Dandelion Memento Ink. Color the centers of the flowers with Dandelion Memento Ink and a dauber. Spritz the petals and use the Groove Golf Tool Set to shape the petals. Set aside to dry. Add the Prills to the centers of the flowers and set aside to dry. Now working with the pink flowers, stamp onto white cardstock using Rich Cocoa Memento Ink. Color with Rosebud Memento Ink and a dauber. Spritz with water and use the Deluxe Flower Shaping tools to shape and then set aside to dry. Once dry punch a hole in the center and thread through the stamen and use hot glue to hold in place. Add glitter to the edges of the flower petals using dries clear adhesive and allow to dry. Decide on placement of the leaves and flowers and hot glue into place. Cut out the tag and using the dimensional tape, adhere to another piece of the paper collection making a little sign. Glue it down. Color the seam binding with Grape Jelly ink and water and once dry tie a piece through the top of the tag. Other Products: Golden Mirror Sheet, White smooth white cardstock, Purple color cardstock, Papericious Vellum, scoreboard, Glue Dots. Instructions: The ready top-fold card base measures, 6" by 8". To prepare the card mats, first choose a paper from the designer paper collection and cut a piece measuring 5 1/4" by 71/4", distress the edges using matching distress ink and layer it on a white cardstock, 1/16" of an inch bigger on all the 4 sides. Further, layer it on a purple cardstock, again 1/16 " of an inch larger on all the sides. Finally mat the panel on the ready card base. Using first 2 larger dies from Frame a Card Leafy Borders Die, cut 4 pieces each from white cardstock and 1 piece each from golden mirror sheet. Stack them together keeping 2 white on base and a golden on top. Prepare 2 of same kind using largest and 2 of the second largest die. Adhere them on the card panel as shown. To Prepare the Petunias, check Emma Lou's video above. Stamp total of 7 large petunias with Magenta Hue and cut them using their coordinating dies. Color the petunia centers with leaf green archival ink and color the edges with Cactus Flower. Further, highlight the edges with Majestic Violet. Shape the flowers using the Deluxe Flower shaping kit. For the centers, cut the stamens from Sunrise Lily Die, paint them using Sunflower yellow archival and Leaf Green archival ink. Roll them between your fingers and add prills using an adhesive that dries clear. Adhere these stamens in the flower centers and press them hard to lift the flower petals. Prick the flower centers and add Black beaded stamen in the center. Cut the wire once the flower center is dry. Prepare 2 flowers using 2 petals and one flower using 3 petals. For the filler flowers, the smallest flower from Classic Rose Cling Stamp set is stamped with Tea Rose and cut using it's coordinating die. Paint the flowers using same ink and shape them using deluxe flower shaping kit. For leaves, images from Leafy Accents Cling Stamp Set are stamped with Library Green, cut them using its coordinating die and colored them using Leaf Green and Fern Green. Shape the leaves using its coordinating mold. Once shaped and dried, highlight the leaves using Sunflower ink, very softly. For the Butterfly, stamp the image on vellum sheet using colorbox white ink and sprinkle white heat embossing powder. Dust extras and heat set it with the help of heat gun. Now cut the image using its coordinating die. Once all the elements are ready, assemble the card as shown and finish the card with a sentiment from the paper collection. Instructions: Click here to view a larger photo of this project. Using your Leafy Accents Stamp set, stamp the larger leaf spray and the swirly leaf spray using the Versafine Olympia Green ink, then color using your stack and store daubers with the Distress Peeled Paint. Cut with coordinating die. Turn your leaves over and color the back fully with the Peeled Paint ink. Lightly spray with your mini mister and shape using your Leafy Accents shaping mold. Using your designer dries white glue highlight the ends of your leaves and apply ultrafine diamond glitter. Allow to dry fully before assembling your headpiece. Make a circle out of your wire to approximate head size, to measure you can tie a piece of ribbon around your head to gage size, do the same if the headpiece is for a child. Make sure you secure in place. Where the wire joins will become the back of the headpiece and the ribbon will conceal the join. Using your hot glue gun adhere your long pieces of ribbon first and then adhere your sheer bow and then your silver twine bow. Choose your desired white stamens and cut the stem in half, curl your first stamen around the wire and the overhang run along the wire, put 1 or 2 stamens every inch until you have gone around the entire headpiece. 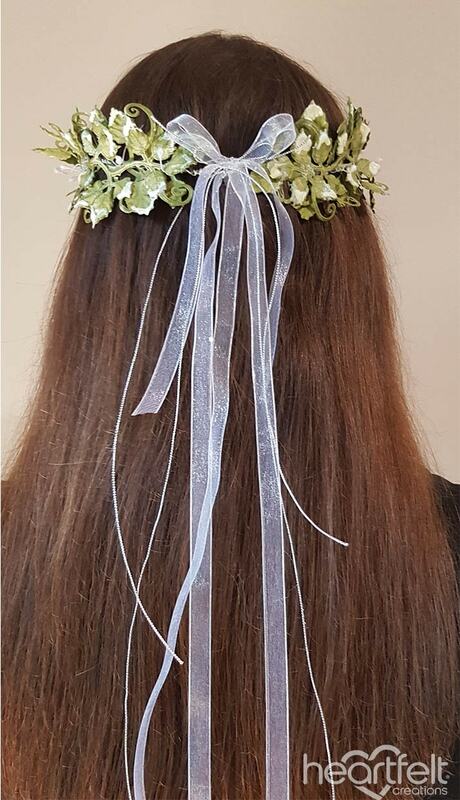 Using your hot glue gun start to adhere the larger plain leaf spray with the stamped side facing inside the headpiece, repeat this until you have filled the center. On the outside of the headpiece adhere the swirly leaf spray with the stamped side facing out until the headpiece is filled. Bend your stamens to the desired positions. You can also spray with a craft lacquer or use glossy accents if you wish the headpiece to be a little stiffer. Instructions: Cut a piece of Creme cardstock at 8 x 8 inches and put a mark on the top of the paper on 4 sides at 4 inches, 4 3/4 inches, 5 1/2 inches, then score 3 sides of the paper from mark till mark. Fold all the score lines, cut some pieces out and make 2 tabs for gluing the box together. You can round some corners with an envelope punch board, but you don't have too. Cut some paper from the paper collection and mat the box on the inside and front, now fold a piece of the Cream cardstock double and put your envelope on top of it against the fold then take a pencil and draw the envelope on the paper, cut it out and glue this behind your envelope, so you can use this as a card. Ink all the edges with the Vintage photo. Stamp the Coneflower from the Blossoming Coneflower set, the Backyard Blossoms set and the Garden Edge Cone flower with Rich Cocoa on white cardstock. Color them on top with Tangelo and then Sunflower yellow and a mix of Buttercup and blend this in each other, the other coneflowers are colored with Vibrant Fuchsia. Put some glue on the tops and sprinkle the decorative sand on them for the pollen. Stamp the Tiny Long flowers from the Backyard Blossom set with the Rich Cocoa and color them with Teal Zeal and the Leaf Green, cut them out with the coordinating dies. Stamp the sweet peonies on white cardstock with potter's clay ink, color with morocco and peanut brittle and cut them out with coordinating dies. Place the petals in the flower shaping mold, mist with water and and run through the die cutting machine. Finish shaping with the Deluxe Flower Shaping Kit. Now stamp the Leafy accents on white Cardstock with Graphite Black, color them with a mix of greens and on top some Vintage Photo, cut them out with the connecting die and put them up side down in the Shaping mold spray them lightly with water put the top on the mold and run it through your machine. If all your flowers are done and dry you can glue them on your envelope. Start with the inside and put some coneflowers there, then move on to the front and make a nice arrangement with all the flowers. On the long Blue Backyard flowers, put some dots with the Nuvo Crystal drops and also a little bit in between the flowers. Using dries clear glue, add glitter to the flowers. Cut out a sentiment label from the paper collection and glue this on the right bottom corner, now take some white gesso and give the whole envelope card a white wash. Instructions: Create easel using the tutorial here for the Calendar Easel Card in dark green card stock, but make it 6 x 6 ", cover it with 6 x 6" panel from the Sweet Peony Paper Collection. Also print a printable calendar and staple it together and attach to front. Stamp and sponge the Large and Small Sweet Peony in Tea Rose, and cut out with corresponding dies. Stamp and sponge Small Sweet Peony in Lulu Lavender, sculpt according to peony tutorial, add stamens and glitter. Stamp and sponge leaves from the Leafy Accents in Bamboo leaves and cut out with corresponding dies, sculpt with the Leafy Accents Shaping Mold. Cut out and distress sentiment from Sweet Peony paper collection and arrange and adhere with flowers and leaves as shown. Instructions: Cut a piece of white cardstock 10" x 7", score at 5" along the long side and fold to make a 5" x 7" card base. Die cut three decorative dies from the HCD2-7192 Eyelet Lace Frame die set in white cardstock and adhere together with foam dots before adhering all the layers to the base card with foam dots. Stamp the image from the HCPC-3815 Words of Comfort stamp set in Tuxedo Black in the centre using a stamp positioner. Stamp the leaf images from the HCPC-3835 Leafy Accents stamp set in Library Green ink on white cardstock, colour in with Fern Green and Leaf Green inks and die cut with the coordinating dies. Shape them using the Leafy Accents Shaping Mold and when dry, adhere them on the card over the top left of the card. Stamp the rose images from the HCPC-3752 Classic Rose stamp set in Vibrant Fuchsia on the Super White cardstock. Colour the images with Buttercup, Rose Madder and Tea Rose inks before die cutting with the coordinating dies. Shape using the Rose Flower Shaping Mold. Assemble once dry in a variety of sizes and add Crystal Clear to the flowers with Dries Clear glue on a damp sponge before adhering over the leaves as shown. Stamp the lilacs from the HCPC-3816 Lush Lilac stamp set in Lavender ink on white cardstock, colour with the Lavender ink and die cut with the coordinating die. Shape the flowers in the Lilac Flower Shaping Mold and allow to dry. Make a hole in the centre of the flowers using the paper piercer from the Deluxe Flower Shaping Kit and thread the wire stamens through the centres and using a hot glue gun seal the stamens to the flowers. Trim the ends of the stamens and adhere them at the bottom left, in the centre and to the top right of the flowers as shown. Stamp the small Wildwood Florals from the HCPC-3769 Wildwood Florals stamp set in Buttercup ink on Super White cardstock and die cut with the coordinating die. Colour the edges in with Buttercup ink and shape using the Deluxe Flower Shaping Kit. Pierce a hold in the centre of the flowers and thread the white glitter stamens through and seal with the Dries Clear glue. Add Crystal Clear to the flowers with Dries Clear glue on a damp sponge before adhering them around the flowers as shown varying the sizes. To finish, add pearls to the decorative die as shown. Instructions: Card size: 7 X 5". First add a layer of pink card stock to the white card base. Die cut Eyelet Lace Frame set from white and from yellow card stock. Glue white die cut to card and use yellow thin die to outline sentiment center die cut. Stamp sentiment on center panel using Pink Peony Ink. Use Rose Madder to stamp, die cut and sponge color on several rose petals before putting them in the rose shaping mold, place in mold and mist then run through your cutting machine. Use Fern Green to stamp, die cut and sponge Leaf Green color on leaves then place them in the new leafy accent shaping mold, mist and run it through your cutting machine to form. Allow roses and leaves to dry completely. Using Vellum, stamp with VersaMark and emboss with clear then die cut butterfly then color with pink peony and buttercup inks. Once roses are dry put them together, alternating petals and pressing in the center of each petal. Add leaves to die cut frame and then add roses. Embellish with pearls. Add butterfly and then give his body a few pearls. Other Products: Morning Dew Nuvo Drops and Pearls. Instructions: Die cut a piece of white cardstock using the largest die from Eyelet Lace Frames Die set. Ink the edges using Pink Peony Archival Ink and Stack and Store Daubers. Adhere it to a 5" x 7" white card base. Stamp the sentiment from Sweet as Honey Cling Stamp Set on a piece of white cardstock using Black Archival Ink and die cut this piece using the die from Intricate Swirl Frames Die. Adhere it on the card front as shown using Darice Adhesive Foam Strips. Stamp the leaves from Leafy Accents Cling Stamp Set on a piece of white cardstock using Coffee Archival Ink and die cut them using matching dies from Leafy Accents Die. Ink them using Leaf Green Archival Ink and Stack and Store Daubers. Shape them using 3D Leafy Accents Shaping Mold. Stamp the Peonies from Small Sweet Peony Cling Stamp Set on a piece of white cardstock using Vibrant Fuchsia Archival Ink and die cut the using matching dies from Small Sweet Peony Die. Ink the flowers using Vibrant Fuchsia and Buttercup Archival Inks and Stack and Store Daubers. Shape them using Floral Basics Shaping Mold and Deluxe Flower Shaping Kit. Add a little Go Man Go Prills from Bright Ideas set to the flower centers. Stamp the flowers from Birds and Blooms Cling Stamp Set on a piece of white cardstock using Buttercup Archival Ink and die cut them using matching dies from Leafy Branch Die. Shape them using Deluxe Flower Shaping Kit. Add a pollen from Small Pastel Pearl Stamens to the flower centers and ink the edges lightly using Vibrant Fuchsia Archival Ink and Stack and Store Daubers. Arrange and adhere the flowers and leaves on the card as shown. Make some ladybugs using Ebony Black and Red Berry Nuvo Crystal Drops and glue them to the flower arrangement. Add some drops of Morning Dew Nuvo Drops on the flower arrangement and some pearls on the die cuts to add the finishing touch. Other Products: White cardstock, Lindy's magical-envy green, gold, mini mister. How to shape classic rose, check here https://www.youtube.com/watch?v=WhvG0Ajn1Qw. Instructions: Card base final size 3.5" x 5.5"
Cut Intricate Swirl Frames Die on white cardstock and adhere it with Designer Dries Clear Adhesive. Now sprinkle some Lindy's magical and sprinkle some water with mini mister and dry it with heating tool. For Flower, take Classic Rose Cling stamp using archival ink rose madder, cut with the coordinating die and color them with rose madder and sunflower. Shape them with Deluxe Flower tool kit. Add Dries Clear Adhesive to the petals and sprinkle with crystal clear glitter. For Leaves, use Leafy Accents Cling Stamp set using Plum archival ink and cut them with the coordinating die and color them with archival ink-fern green and rose madder. Shape them with 3D Leafy Accents Shaping Mold. Adhere the flowers and leaves to the card base. Now stamp the sentiment from Heartfelt Love sentiments using Plum archival ink on white cardstock, cut out and adhere as shown using Double Dots. Instructions: Ready project measures 8"x8". Take a MDF box and apply gesso evenly. After drying apply texture paste using stencil. Color the box with Lindy's starburst sprays. Stamp Sweet Peony flowers on the flower making paper using cactus flower ink. Stamp some Wildwood Florals flowers using sap green color and cut with coordinating die. Paint the peony flowers with cactus flower and venetian orange color. Shape the flowers using Deluxe Flower Shaping Kit. Stamp the leaves using olive green ink and cut with coordinating dies. Color the leaves using leaf green, library green and olive green color. Shape the leaves using leafy accents mold. Take a MDF clock frame and a sentiment, color them with white acrylic color. Also spray with pink color. Apply glitter on both using adhesive that dries clear. Take a pattern paper from Young at Heart collection and cut it according to size of frame. Also cut an acetate sheet of the same size. Glue a picture and acetate sheet on the pattern paper. Glue the frame over the pattern paper as shown. Adhere the frame on the centre of the box. Glue the cheese cloth and sisal near the frame. Arrange the flowers and leaves around the frame and glue them using hot melted glue. Apply the glitter over the flowers. Futher apply the gesso on the flowers and leaves using dry brush technique. For more tips on creating with the Classic Rose collection, watch the tutorial at https://youtu.be/Z8P070kC3oo. Instructions: The finished card measures 8 inches by 8 inches. Cut two pieces of white card stock one 8 inches by 8 inches and the other 8 inches by 8 1/2 inches. Score the second piece at 1/2 inch mark and fold. Apply clear glue inside the fold and attach the first piece forming the card base. Cut another piece of white card stock a little smaller than the card base. Distress the edges with a paper distresser and tear some portions as shown. Adhere this to the white card case using clear adhesive. Cut a pattern paper from dogwood paper pad to the size 1/2 inch smaller than the mat layer. Distress the edges with paper distresser and adhere to the mat layer using foam strips. Add a frame from the 6 x 6 inch card panel and cut out the centre to make a square frame. Cut another pattern paper and attach it to this frame. Adhere this to the card base with foam strips. Using distress ink, colour the frame background using water and brush. Cut a cage and add some backing paper to it. Adhere to the frame using foam strips. To make the leaves - Stamp the leaves from the stamp set with Library green ink. Color using leaf green with daubers. Cut with coordinating die and shape them using the leaf shaping mold. Give further shape by using groove golf tools mini size and stamp mat. Stamp the Rose flower with vibrant Fuschia and colour using the same ink and scattered straw. Cut with coordinating die and shape in the 3D rose flower shaping mold. Add more natural look using the grove golf tools. Follow the video tutorial for flower shaping. Stamp and cut two doves. Cut two hearts from Eyelet heart die using the smallest heart. Apply glue on them and add glitter. When dry distress the edges with aged mahogany ink. Attach the doves and hearts with foam dots. Arrange the leaves first and then add the roses. 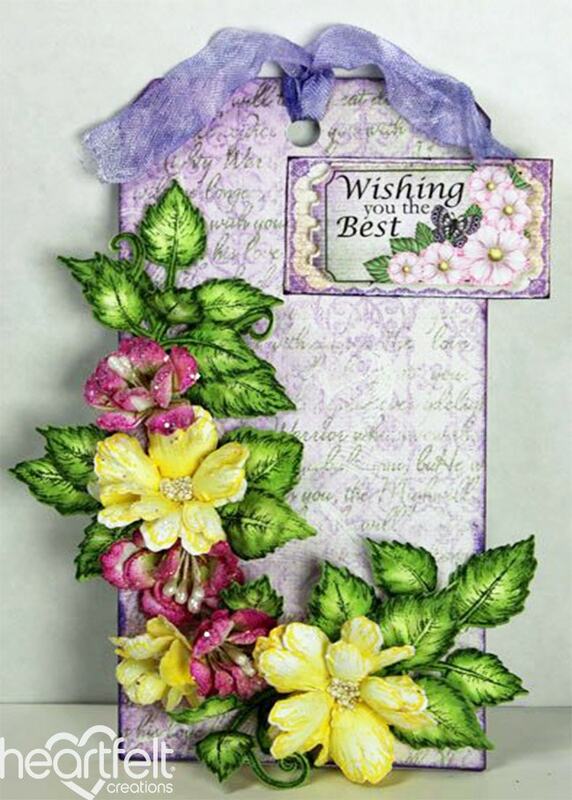 Finish the card by adding some filler flowers and a sentiment. Instructions: To create card base, cut cream card stock 6" x 12", fold in half. Cut pink card stock 5 3/4" square and add to card. Cut 6" square card panel from design paper to 5 5/8", add to card. Sponge Designer Dries Clear Adhesive around edge of card and add gold mist glitter. Cut cream card stock 2" x 5 1/2". Measure up 1/2" from the bottom, cut from the outside corner to the center on both sides to create the banner. Die cut the 6.25 x .75" border from the Border Essentials in gold mirror card stock. Add to the left side of the banner. Add to card. Cut a piece of lace 5" long and add to banner with Fabric Fusion. Die cut doily from the Butterfly Kisses Decorative Die in gold mirror card stock. Stamp the sentiment from the Words of Comfort stamp set on white card stock with VersaMark and emboss in gold. Cut in 2" circle. Add shabby white embossing powder around edge, heating from underneath. Add to doily. Add to card. Stamp butterfly on cream card stock with VersaMark and emboss in gold. Color with watercolor pencils. Die cut. Stamp Carnations on pink card stock with Spun Sugar for the larger flowers. Die cut and shape with 3D mold and flower shaping tools. Sponge on Designer Dries Clear Adhesive and add gold glitter. Add Assorted Bead Stamens Medium to 2 of the flowers. Stamp 10 of the smallest Carnations on cream card stock with Spun Sugar and die cut. Use 2 layers for 5 flowers. Sponge on adhesive, add gold glitter. Add Bridal Bouquet stamens. Stamp leaves on green card stock with Memento New Sprout. Dab a little Memento Bamboo Leaves ink to center of leaves before die cutting. Mold with 3D Leafy Accents Shaping Mold. Add the main leaf, the 2 leaf and 3 leaf images to the card. Add flowers with hot glue. Add ribbon and butterfly to card. Instructions: Cut a piece of white cardstock 10" x 7", score at 5" along the long side and fold to make a 5" x 7" card base. Die cut the base of the Intricate Swirls Die from white cardstock and adhere to the base of the card. Cut a piece of Sweet Peony patterned paper 4" x 6" and using the largest plain edge die from the Small Ovals die set die cut the centre out. Die cut the frame from the Intricate Swirls Frame die from white cardstock. Add Frosting Powder to the frame with Dries Clear glue and adhere to the base of the card. Die cut the eyelet frame using the eyelet edge from the Small Oval Basics die set and the second largest plain edge die from the Large Oval Basics die set and adhere the frame over the oval cut from the paper. Die cut the small pink frame from the second largest die from the Large Oval Basics die set and the largest plain edge die from the small Oval Basics die set. Adhere around the oval in the centre. Stamp the leaf image from the HCPC-3835 Leafy Accents stamp set in Library Green ink on Super White cardstock, colour with Fern Green and Leaf Green inks and die cut with the coordinating die. Add Crystal Clear to the leaves and flourishes with Dries Clear Glue and adhere to the oval as shown. Stamp the rose images from the HCPC-3752 Classic Rose stamp set in Vibrant Fuchsia on the Super White cardstock. Colour the images with Buttercup, Rose Madder and Tea Rose inks before die cutting with the coordinating dies. Shape using the Rose Flower Shaping Mold. Assemble in sets of two petals each size and add Crystal Clear to the flowers with Dries Clear glue on a damp sponge. Add Heart of Gold Prills to the centres of the flowers before adhering over the leaves as shown. Stamp the sentiment from the HCPC-3818 Lush Lilac Scroll and Notes stamp set in Tuxedo Black ink on white cardstock and die cut the frame from the centre frame die from the HCD2-7192 Eyelet Lace Frame die set. Die cut the outside frame only from the white cardstock and add Frosting Powder to the frame using Dries Clear on a damp sponge. Add to the base die with the sentiment and adhere to the card on the top left as shown. Instructions: Score your white cardstock to 5.25 x 7.25" using a bone folder to get a nice crease. Take your sheet of patterned paper from the Classic Petunia collection and cut to 5 x 7" and adhere to your card front. Take the wood embellishment and adhere to the front of your card. To create the flowers you will need to stamp in the Platinum Planet ink on your white cardstock a total of 18 small peonies. Now diecut each set and ink the edges using the worn lipstick distress ink to give the flower edges more depth. Each bloom will have 3 layers that will be staggered. Apply some Nuvo silver lining drops to your flower edges and then lightly dust some frosting powder. For the leaves take a sheet of paper "green in color" from the Sweet Peony collection and stamp your leaves in Memento Bamboo Leaves dye ink. Once done, diecut with the coordinating die. Remove and now place in the Leafy Accent mold and spritz with a touch of water. Run through the die cutting machine and then heat set which will give your leaves a nice look. Line your leaves with glue and add additional frosting powder and use your dauber to add additional ink for a deeper look. Instructions: Card size is 6 x 6". Cut pearl white metallic cardstock 12 x 6", score on the long side at 6" and fold to create card base. Cut a mat layer from pearl white metallic cardstock 6 x 6". Cut the Frame a Card Leafy Border from pearl white metallic cardstock, sponge with dries clear adhesive and cover with Rajni Chawla's Crystal Clear. Cut another mat piece 4 x 4". Cut a 6 x 6" panel from the Butterfly Dreams paper collection, trim to 5 7/8 x 5 7/8", ink the edges and adhere to the inside of the card. Adhere the Leafy Frame on the 6 x 6" mat layer using dries clear adhesive. Then adhere to card base using dimensional tape. Stamp the sentiment on the 4 x 4" mat layer with Magenta Hue ink and sponge the edges with the same ink. Adhere to the card base as shown using dimensional tape. Stamp the flowers on pearl white metallic cardstock with Magenta Hue Ink, add more color to the tips and diecut using the coordinating die. Place face down in the 3D Rose Shaping Mold and run through the die cutting machine. Finish shaping with the deluxe flower shaping kit. Sponge the edges with glue and sprinkle with Crystal Clear Glitter. Add dries clear adhesive to the centers and sprinkle with Minnie Pearls Prills. Stamp the leaves on pearl white metallic cardstock with Olive Archival ink, color with the Olive and Magenta Hue inks and diecut using the coordinating die. Place in the Leafy Accents Shaping Mold, spritz with water, run through the die cutting machine and finishing shaping with the deluxe flower shaping kit. Sponge the leaves with dries clear adhesive and sprinkle with Crystal Clear Glitter. Adhere the flowers and leaves to the card using the hot glue gun. Instructions: Score a 11.5" x 5 3/4" piece of kraft card in the centre to give a 5 3/4" square card base. Cut a 5.5" square piece of white card and spritz with water, add a small amount of brusho and pixie powder, allow to dry. Blend Summer sky ink to any white areas. Edge the card and stamp the florals over the card with night of navy ink. Adhere to the card base. Die cut a plain blue (sky) label from the paper pad. Stamp sentiment in night of navy, add clear embossing powder, heat to set. Thread the ribbon through the label hole and add to the card using foam pads. Make the leaves: Stamp the leaves in old olive ink and die cut. Place, upside down onto the shaping mold and spritz with water. Put the lid on the mold and run through the die cutting machine to shape. When dry spritz lightly with rich gold mist, allow to dry. Add a little warm cocoa ink to the edges of the leaves and set aside. Make the flowers: Stamp the flowers onto blue paper from the paper pad using night of navy ink. Add some shading using Summer sky and night of navy ink and die cut the flowers. Mist the back of the flowers with water and shape. Add a dot of glue to the centre of the smaller flowers and cover in gold glitter, allow to dry and remove the excess. To make the bigger flowers use 2 layers and thread the small stamens through the centre. Position the leaves and flowers and a few additional stamens using hot glue for the larger items and wet glue for the small flowers. Instructions: Prepare a 6 x 6" black card base. Cut one of the 6 x 6" card fronts from the Sweet as Honey Paper pack, trim 1/8" off all 4 sides, add D-Dots to the back and adhere to card. Stamp the Flowers on white cardstock with the Black ink, cut out with the matching die, color in with the Buttercup ink and shade with the Tiger Lily. Place in the Floral Basic mold and run through your die cutting machine. Finish shaping with the Deluxe Shaping Kit. Add Stamens to the center of each flower. Stamp the leaves on white cardstock with the Olive ink. Cut out with the matching die, color in with the Leaf Green, and shade with the Emerald Green. Place in the leaf mold and run through your die cutting machine, finish shaping with the Deluxe shaping kit. Arrange all the leaves and flowers around the card on the left side. Stamp the sentiment on white cardstock with the black ink, cut out using the Eyelet Lace Frame center. Add D-Dots to the back of the sentiment part, apply glue to the back of the lacy part and adhere to the right side of the card, adhere the sentiment in the center as shown. To finish the card, add glitter to all the leaves and flowers using dries clear adhesive. Instructions: click here to see a larger photo of this project. Stamp the Large Sweet Peony Cling Stamp Set on foam paper with Ranger Archival Ink Pad - Garden Patina and cut using the coordinating dies. Colour with Gallery soft oil pastels 241 and 224. You will need 2-3 petals to create each flower. Use an iron or heat gun to heat the petals and when they start to shrink, move them to the Molding Mat and press on the middle using shaping tool - using bigger one. Layer the petals together using the hot glue gun making sure to offset them, use a paper piercer to make a hole in the middle and pull through the stamens. Add a little hot glue to the underside of the flower to adhere (watch tutorial). Sponge the petals with dries clear adhesive and sprinkle with Crystal Ultrafine Transparent Glitter and Rajni Chawla's Crystal Clear glitter. Stamp the leaves using Leafy Accents Cling Stamp Set on the white paper with StazOn Ink Pad - Olive Green, cut out with the coordinating die, shade use this same ink and shape leaves using Leafy Accents Shaping Mold as shown on the video. Adhere the flowers and leaves together using a hot glue gun and adhere a pin to create brooch. Other Products: Smooth white cardstock, Archival Ink Pad (Venetian Orange), Distress Oxide (Vintage Photo, Spiced Marmalade) Glossy Accent , Glitter , Cheese cloth. For more tips on creating with the flower shaping molds, watch the tutorial https://youtu.be/KDbdzC0MnAI. Instructions: Ready open card measures 10"x7". To create a U-fold card follow the amazing instructions by "Maymay made it". Create a U-fold card with the white cardstock. For matting, choose a pattern paper from the sweet as honey paper collection. Distress the edges of the pattern paper using venetian orange ink. Stamp the sweet peony flowers using red geranium color on white cardstock and cut with the coordinating die. Color the flowers with venetian orange and shape them using deluxe flower shaping kit. Stamp the leafy accents leaves using leaf green color, cut with coordinating dies and paint with the same color. Shape the leaves using leafy accent shaping mold. Also stamp some leaves from the garden's edge coneflower stamp. Cut a yellow cardstock using honey comb die and slightly color it with distress oxide vintage photo and spiced marmalade. Apply glossy accent on the honey comb die as shown. Cut some preprinted images from the pattern paper using their coordinating die. Glue a cheese cloth on the left side of the card and start arranging flowers and leaves. Glue them with hot melted glue. Glue the honeycomb die on the right side of the card. Glue the preprinted images using acetate sheet for added dimensions. Cut the borders from the white card stock using sweetheart border die and glue them on the both edges of the card. Cut a sentiment strip from the same paper collection. Glue the borders on both sides of the strip and arrange it as shown. For finished look, apply glitter with glue that dries clear. Instructions: To create the card base, cut white card stock 5 1/2" x 8 1/2", fold in half. Cut black card stock 4 x 5 1/4", add to card front. Use card panel from design paper that is 3 7/8" x 5 1/8"and add to card. From white card stock die cut doily from Butterfly Kisses Decorative die. Add to center of card. On white card stock stamp Camelia Carnation flowers in Aquamarine, Wild Honey and Rusty Hinge. For each flower use 2 - 2.75" x 1" and 1- 3.25" x .75" flowers, with Pastel Pearl Small Stamens. For single flower cluster, use 3 - 3.25 x .75 with Pastel Bead Medium Stamens. Diecut using the coordinating die. Stamp the leaf with the curls on white card stock with Bamboo Leaves and on vellum with VersaMark and emboss with Shabby White embossing powder. Die cut. Adhere vellum leaves on white card stock leaves on the stem portion only. Shape the flowers with the 3D Floral Basics Shaping Mold and the Flower Shaping Essentials tools. Stamp the bee on white card stock with Saddle Brown, color with Prismacolor pencils and diecut using the coordinating die. Add the flowers, bee and ribbon in the center of the leaves. Stamp the sentiment with Jet Black and fussy cut. Edge with Wild Honey. Add to card. Instructions: Blue patterned paper is the full size layout background. Black cardstock is cut to11.25x11.25 and Kraft cardstock is cut to 10.75x10.75. Adhere these layers together. Die cut one of the mini honeycomb image from black cardstock. Then cut apart into smaller pieces. Set aside. Double mat both of the photos in white cardstock. I adhere them together where they overlap. Using the different sized hexagon dies, cut shapes from green, blue, yellow, plaid and polka dot patterned paper. Use the matted photos as a guide and start to adhere the hexagons up the middle of the layout and a little bit to the sides. I layered some using 3D foam squares. Also add in the pieces of the mini honey comb you cut earlier. Adhere the matted photos to the layout using 3D foam squares. Stamp and die cut 2 sets of the Classic Rose images onto white cardstock using dark brown ink (Early Espresso). I added color to the flowers using ink and daubers, first with yellow (Fossilized Amber) and then with orange ink at the tips of the petals (Spiced Marmalade). Run the flowers through your chosen machine with the 3D Rose Shaping Mold. 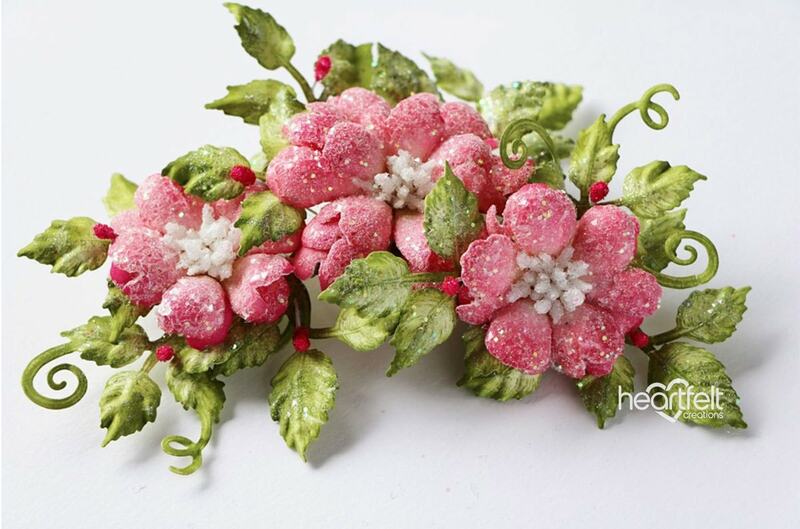 Tweak and assemble the flowers, and using liquid adhesive add beads to the middle of each flower. Let dry. Stamp and die cut 2 sets of the Leafy Accents swirly leaves onto white cardstock using dark brown ink (Early Espresso). Add color to the images using daubers and green ink (Fern). Run the leaf images through your chosen machine and the 3D Leafy Accents Shaping Mold. Cut into smaller pieces. Adhere the flowers to either side of the matted photos. Then I added the leaf pieces around the flowers. Add the painted wood veneer word to the bottom right hand corner of the layout. Stamp and die cut 1 of the Honey Jar image and one set of the Honey Bees onto white cardstock in dark brown ink (Early Espresso). I added color to the honey jar using Chameleon Pens (YO2, YO3, NU1, NU3, PK3). I added yellow Stickles to the Honey Jar. Add color to the bees using Chameleon Pens (CG8, YO2, YO3, BG1, BL3). Add light blue Stickles to the wings. Adhere to the layout using 3D foam squares around the flower clusters. What do you like about what you just saw? Love the new leaf bundle, just got mine, can’t wait to use it! You guys always come up with the neatest ideas, and thanks for the platinum program too. I like all of them. Thank you for sharing these absolutely lovely ideas. Each one is uniquely beautiful. So Happy to see all the ideas for the beautiful lacy frames----love everything, and can't wait to receive my leaf stamp, die, and mold! The molds have made everything so easy---and I have them all!! This leaf bundle is a terrific idea! My mind is going crazy with endless possibilities, I can hardly wait to get the bundle!! I ordered it through my LSS, and am so excited, since she'll probably do a class with it!! WOW!